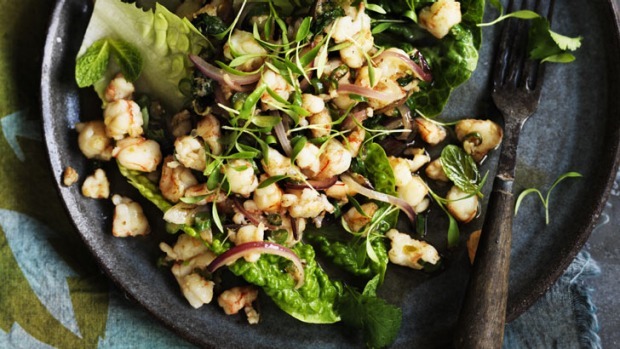 This spicy prawn salad also works well with chicken or pork mince. If you like it super spicy, roast a dry chilli till black, grind and add to the salad. To make the ground roasted rice, cook a handful of jasmine rice in a pan over medium heat till just coloured. Remove and grind in a mortar and pestle. Pound the garlic and chillies in a mortar with a pestle to form a fine paste. Heat a wok over high heat until just smoking. Add the peanut oil and, when hot, add the prawn meat, sea salt, onions and beans and stir fry for about 1 minute. As soon as the prawns start to cook, remove from the heat and add the garlic and chilli paste, sugar, fish sauce, lime juice and herbs. Stir together, taste and adjust the seasoning if necessary. Place the lettuce leaves on a plate and spoon in the prawn mixture. Sprinkle with the ground roasted rice (see introduction at top) and serve. Food Photography by William Meppem. Food styling by Hannah Meppem. Food preparation by Nick Banbury.